You can contact Hambleton Hall by telephone +44 (0) 1572 756 991, email [email protected] or by post directed to the following address: Hambleton Hall, Hambleton, Oakham, Rutland LE15 8TH. You can find Hambleton Hall at the following address, Hambleton, Oakham, Rutland LE15 8TH, United Kingdom‎. Click here to view a map and for directions to the hotel. We look forward to welcoming you from 3.00pm on the day of your arrival and ask if you could vacate your room by midday on the day of your departure. Should you plan to arrive earlier, please let us know and we can make arrangements to look after your luggage while you perhaps take a stroll around Rutland Water. Dinner reservations are from 6.45pm. Please give us as much notice as possible of any changes in your dinner reservation. We do not automatically hold tables for house guests at lunchtime, so please reserve any places you require. Please note all food, drink & other dining room items are subject to a discretionary service charge of 12.5%. The minimum age in the restaurant is 5 at lunch and dinner. Most room rates quoted when you made your reservation will include breakfast. Reservations can help so please ask if you are unsure. The Dining Room is open for breakfast from 7.30am until 9.30am. Room service is available until 11.00am. Please discuss with us any requirements you may have outside these times. Our restaurant is elegant and the vast majority of our clients are smartly dressed. We endeavour to meet all reasonable special requirements given adequate notice but cannot take responsibility for the presence of ingredient traces that may affect clients with dangerous allergies. We do not allow smoking in the house or bedrooms. The Sitooterie provides some shelter for smoking on the terrace. We have a number of valued clients who are wheelchair users. Unfortunately the nature of our Victorian building makes it impossible to comply fully with the latest specification for full wheelchair access. Our guest cloakrooms and guest lift are not fully compliant with current guidelines for wheelchair users. Please check our full Access Statement. We welcome well-behaved dogs and they have their own guidelines, which can be viewed in full below. Dependent upon the weather, our outdoor heated swimming pool is open from around 1 May to 30 September. This is for the use of hotel guests staying overnight. To comply with current Health and Safety regulations, the pool is subject to CCTV surveillance. We do not permit unaccompanied children to use the pool. The pool is closed during the hours of darkness. Due to our size, we do not employ a Night Porter but do offer emergency night service from midnight until 7.00am. Please let us know in advance if you require access/egress between 11pm and 7am so that we can make special arrangements. Many guests stay with us to celebrate a special occasion. If we can help in anyway with your celebrations then, let us know – we will be as discrete as you require! We offer gift vouchers and packages to suit all occasions. Visit our gift voucher site by clicking here. Please find outlined below information that we hope will ensure you enjoy your visit to Hambleton Hall, regardless of whether your life is affected in some way by a medical condition, disability, impairment or specific learning difficulty. Enquiries and reservations may be made by telephone or email. All reservations should be made in advance. Should you require a taxi to the hotel from Oakham, Peterborough or other areas or Rail Stations or East Midlands Airport (approximately 45 minute drive), we use a reliable company on a regular basis and we would be delighted to book them on your behalf. Arrivals drive to the front of the hotel. We have a reserved area outside the reception office which we will ensure is available for you on arrival. We also offer a valet parking service to all arrivals. Entrance to the hotel is by way of two steps which can be covered by a portable ramp which is suitable for wheel chair access. Accounting and credit card payment facilities are portable and brought to the guests for their convenience. Our corridors are well lit and are either carpeted or polished stone floors which may need some guidance and assistance for people with walking difficulties. A member of staff will always be on hand to offer assistance. Our Bar and Drawing Room is accessed directly from reception through wide doors. Because of the nature of our external areas and garden, access is limited. In the summer months access to the Terrace and the lower garden is via the gravel path around the west end of the house. Assistance is always available. The terrace itself is paved stone. The Dining Areas are on the same ground floor level and are accessed along a corridor. There are a number of fire doors along the main corridor from reception to the restaurant and toilets. They are all held on magnetic catches. We do not have a designated disabled cloakroom and listed building constraints mean the cubicles are difficult to access for wheel chair users. Entrance doors to the cloakrooms have door closers installed. However, every assistance will be given by discreet staff if required. The fire alarm system is a continuous bell and does not have flashing lights. Assistance is given if evacuation is necessary. There is ample movable seating and there are chairs available with or without arms. We offer assistance if the guest wishes to transfer from wheelchair to restaurant chair. All areas are well lit. Additionally at night candles are on all tables when the wall lights are dimmer. The menu is printed on cream paper and can be verbally presented if required. The limited size of the house means that there are no bedrooms at ground floor level and all accommodation is on the first or second floors accessed by stairs or lift that will take standard sized wheel chairs. The lift door opening is 66cm. The lift has an internal width of 86cm and a depth of 62cm. Many of the bedrooms are not suitable for wheel chairs because of physical obstructions i.e. deep sided baths, steps in split level bathrooms. Our reservation team have full knowledge of the house layout and will be pleased to discuss specific access requirements with any guest. A small fridge would be available on request for any medication. Service dogs are welcome. Guests with hearing difficulties need to advise us on arrival. In the event of evacuation a member of staff will go directly to their room to raise the alarm and assist as required. We have tried to be as accurate as possible and have included as much detail as we can in our Access Statement, however we welcome your feedback to continuously improve on the information we provide. If you require further assistance please call 01572756991 and ask to speak to the General Manager, Christopher Hurst. Please let us know in advance if you plan to bring your four-legged friend with you. We can then have everything ready. In advance we ask that dogs are more than a year old, are house-trained and will be comfortable staying in an unfamiliar environment. Several of our bedrooms are suitable for dogs but as they are not huge, we feel that two dogs of a medium size is the maximum. We do ask that dogs do not sleep on the hotel beds but can, if required provide suitable bedding if you are not bringing your own. We hope that owners will be taking dinner with us in the dining room but do ask that dogs are not left alone in the bedrooms. Some prefer to be safe and secure in their own cars, while others sleep in a travel cage (we have one if needed). Alternatively, if advance notice is given, we can organise a dog sitter or the staff in the office love some company in the evening if they will settle in an unfamiliar place. There will be a charge of £10.00 per night, per dog for the upkeep of the room. Any damage to furniture and fittings may be charged for. We are a small house and a bark can travel a long way. Please may we ask that you consider our other guests during your stay. 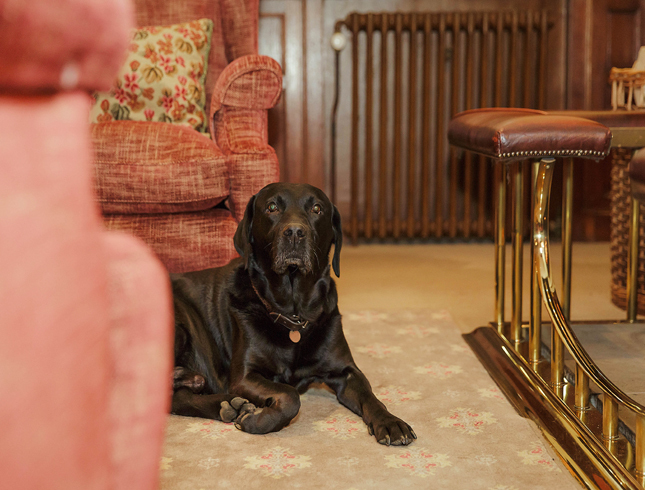 We ask that the Drawing Room and Bar remain dog-free. However the seating area in the hall is a great place to watch the world go by – and has a great fire to warm up after a winter walk. In the summer months there is plenty of seating outside. Apart from assistance animals, dogs are not permitted in the hotel dining room. There are some great walks around Hambleton and reception has a map and details of where to go. Being in the middle of a farming community, there is livestock in many of the footpath fields and out of respect to our farmer friends we ask that dogs are on leads when out and about. We would be most grateful if our amicable dog-guests could refrain from using our lawns as a loo. Delightful loo areas are to be found in the slightly longer grass and field between the bottom of the gardens and Rutland Water. Given a little notice, we can provide leads, bedding, poo bags, bowls, food and biscuits, crates & cuddly toys together with waterproof coats & towelling for muddy paws. For the owners we have Le Chameau wellies and local dog-friendly places to visit.